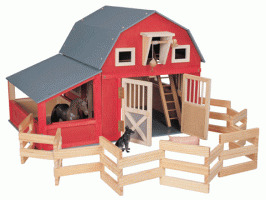 The Deluxe Red Gable Barn is a sturdy barn with a stable where a favorite equestrian friend can be housed, and spacious common area for other farm products and animals. This detailed barn is made more realistic with working doors and hayloft crank. With such an intricate barn, imagination can not help but be sparked! So let your children participate in creative play with their farm friends and accompanying barn. Ages 7+.